The first volume of our ECL Examination Topics English Level B2 book with CD comprises real exam-like tasks in seven topics of the ECL Language examination: Studying and Work, Communication, Culture and Civilisation, The Media, The European Union, Environmental Protection, Travelling and Transport. Every unit includes a section on a grammatical feature with explanations and exercises. Each unit contains answer keys, tapescripts and a list of the most important vocabulary with English explanations. You also find sample oral exams with questions and answers. The colour pictures are in the appendix. 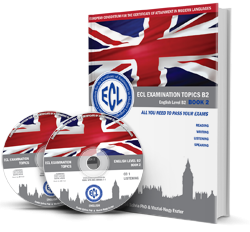 If you order the three ECL Examination Topics B2 books together (that cover all of the 20 ECL intermediate topics) you get 10% off and free shipping.